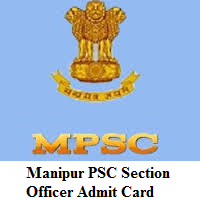 Manipur PSC Section Officer, Deputy Manager Admit Card 2019 Released..!!! So, download that from this page. And the Manipur Public Service Commission (MPSC) officials had released the examination dates of Section Officer, Deputy Manager Posts that is from 24th February 2019 to 2nd March 2019. The officials had not yet released the MPSC Section Officer Hall Ticket 2019 in the official site. And the Admit Card will be available on the official site from 18th February 2019. Candidates who had applied for MPSC SO Recruitment and waiting for MPSC Section Officer Admit Card 2019 can download it by using the steps which are provided at end of this page. The MPSC Recruitment board is conducting the examination to fill 376 Section Officer, Deputy Manager Posts. Candidates who are interested in working for Manipur Government jobs can make use of this opportunity. Aspirants who had applied for Manipur PSC Section Officer, Deputy Manager Recruitment 2019 with valid details will only get the admit card. The selection process for this MPSC Recruitment is done through two rounds those are Written Test and followed by Personal Interview. Candidates who had reached the eligibility criteria mentioned by the organization members will only get the mpscmanipur.gov.in Hall Ticket 2019. While attending the examination hall, candidates need to carry some important documents for the security purpose. List of the documents is mentioned below. You can carry any of those documents. Firstly, candidates must go to the official site of the Manipur Public Service Commission (MPSC) @ mpscmanipur.gov.in. Then the home page of MPSC will display on the screen. Move to the Download E-Admit Card section which is present at the left side of the home page. On that page fill the Select your post, Name, and Date of Birth (DD/MM/YYYY) details and search for the MPSC Section Officer Hall Ticket 2019. Open that link and fill the required information in it. Then you will get the MPSC Section Officer Admit Card 2019. Download that Admits card in the prescribed format. Take two or more copies of mpscmanipur.gov.in Hall Ticket 2019 and carry them with you while appearing to the test. All the best for the candidates appearing for the Manipur PSC Section Officer, Deputy Manager Recruitment 2019 Examination. We hope that the information mentioned above is useful for your reference. For any queries, candidates can be in contact with us at freshersnow.com.